Verdict - Manikarnika is another opportunity lost. A brave woman freedom fighter. Biopics seem to be the new genre in vogue.The pre- Independence period is full of bravery,sacrifices and off course treachery as well. All this is retold with reference to a woman warior- Manikarnika aka Laxmibai aka Jhansi Ki Rani. The East India Company( the Invaders in the guise of traders) had captured many a princely states with gun power,tyranny and deceit. They we're faced with a stiff opponent in the princely state of Jhansi.Why? All because of her self less devotion to her motherland.Though her kingdom got completely ravaged,yet she regrouped herself ,until she became a martyr. Look at the characterisation of the protagonist.She was brave since her child hood.An ace Archer and fearless sword fighter.Despite being a queen,she had compassion and a sense of belonging with the masses.She led from the front.She was a great strategist.Was fortunate to have many a fathfull on her side,but rebels as well.Though the Mutiny of 1857 got crushed,she never gave up.She was a devout Hindu( the war cry of Har Har Mahadev resonates during the battle scenes).She lost her only son and her husband in her early coronation days.Despite being widowed,she did stand for dignity for all widows.She stood for women empowerment even in orthodox male dominated society.She was much ahead of her times.Since she preceeds,many freedom fighters she was of the firm belief that freedom has to be gained by force.Later on Subhash Chandra Bose,Bhagat Singh et Al also follow the same path .Gandhianism was the other route. Where are the fact lines then? To me the film seems to be dated.The impression one gets is that it has taken a long time to make it.The background score seems to be week.The desh bhakti songs come in spaces ,not as a whole.The lyrics of the freedom movement of yore we're more powerful.The battle scenes are assembled and presented through VFX technology. Had this movie been under the supervision of a Sanjay Leela Bhansali,it could have been more powerful . Not withstanding the flaws,the movie at least has high production values,forceful acting by Kangana,and the well deserved patriotic' fervour a la Uri. The younger generation must be made aware of the past to always be enthused by the sacrifices of all their ancestors. The One True Queen with Substance! So much of our history is full of Courage and Heroics, which can be made into legendary films. Manikarnika is one of those Legendary films. We all have read about The Queen of Jhansi and know that she was the pioneer to sprout the idea of a free One complete Bharat Varsha. 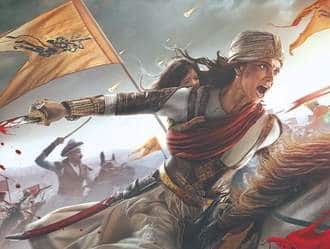 Her courage and connect to the people at large made her the legend known as “Jhansi Ki Rani.” A true Queen a rear Jewel in the Indian freedom fight with all the mettle of a fearless Warrior, Governor, Strategist and above all a True Leader. Manikarnika is all about this one True Queen with substance, hence you will see her occupy almost all the frames of the movie. I have no complaints as it is absolutely well deserved. I don’t think any debutant director would have picked up a historical representation and portrayal of larger than life Hero like The Queen of Jhansi. Kangna Ranut gets full marks for directing along side Krish Jagarlamudi known for his work in Telugu Cinema. Technically the war scenes and sword fight sequences are exceptionally perfected. However, the emotional side of the queen and her early life incidences require missing finesse. The initial sword tutorial sessions seem unfitting on Kangna who plays Manikarnika. But she pretty much makes up for them in the second half whereby she excels every move with extreme resilience and rigor making her credible for a warrior queen who has been playing with swords and horses since childhood. Every dilemma, emotion and helplessness of the situation that transforms into this courage that comes within her are these intense expressions of eyes, Kangna almost gives you goosebumps. The Patriotism that makes every woman in Jhansi fight for her queen is a voice that can shake the Himalayan ranges. Kangna playing this warrior queen is the ultimate tribute well given. Manikarnika may have well been dramatized and parts of other characters been reduced, but it’s purpose to show the life, choices, mental and physical strength of a woman with forward thinking will give you an experience of history coming alive in front of your eyes. The dampener is the scripting for East India company whereby they have hardly any dialogues to deliver other than the few short ones on repeat mode. The gruesomeness has been purposefully kept low. However, one can imagine the real intensity of these wars. We should be watching Manikarnika along with our children, this tale should replace fairy tales. Our children ought to know what real courage and being fearless means. In today’s world where petty issues become the deciding factors for governance, and hashtags rule. The reality of what it real means to stand for something right and making hard choices needs to be reminded. I am glad that creative arts allow and make space for Manikarnika to remain immortal and our privileged generation to inspire and course correct. I never give stars to any movie in my review but I would give Manikarnika : The Queen of Jhansi 4 stars out of 5 for the fact to have been made. It will be a shame for any Indian anywhere in the world to ever miss an opportunity to watch it. The review would be incomplete without the mention of the end that left me feeling and thinking “Khub ladi Mardani woh to Jhansi wali Rani.” Jai Hind! This is equal to Bahubali. Wow great movie everyone should this movie. Great Great Great. The role of every character is best very nice movie. Now, I had to take 15 minutes and at least 12 attempts in constructing the title of this review as I was trying to justify Miss Ranaut’s brilliant, zestful, and heartfelt performance in one senstence. But, the truth is that her efforts, energy, and most importantly the heart which she has brought to the character of Manikarnika- The Queen of Jhansi cannot be summed up aptly or justifiably in one sentence, one paragraph, or even one article. This is because we have all watched one man armies on the screen many times, but for the first time we are relishing the power of an Indian woman and Kangana is no less than a one woman army in this movie. She solely carries the first female-centric period drama of Bollywood on her bold shoulders. She leaves no stone unturned in giving shape to her performance or in her direction( well, that’s what the final credits stated). She has visibly put in a lot of efforts in attaining the physicality of the legendary Manikarnika, but she has also put in humungous amount of efforts in learning sword fighting and horse riding and no doubt it shows on the screen. The only other person that can be talked about in this movie apart from the heroine is Danny as he brings the right amount of righteousness, credibility, and honestly in his role which is shown in a positive light as contrary to most of his performances on screen. His voice quality is impressive and the supporting cast apart from him including Zeeshan Ayyub is also commendable. But, besides that it is all a Kangana Ranaut show as she imbues so much of honesty, fighting spirit, and fire to her character that it seems that she was destined to play the role of Jhansi ki Rani. She fights fearlessly, walks with swagger, kills the British soldiers with venom in her eyes, and brings the screen on fire in scenes which the patriotic madness and intensity possessed by Rani Lakshmi Bai. The special effects and cinematography are also commendable as the movie transports you to the era of the 19th century India. But, apart from Ranaut, the historical and celebrated story of Jhansi ki Rani is also the star here as it compells you to develop respect not only for the Queen, but for the entire women community as elements of feminism and motherly respect shown towards the nation is bound to stir up respect among the men towards women.